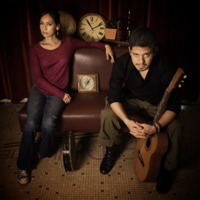 Rodrigo y Gabriela (Rodrigo and Gabriela) are a Mexican musical duo who specialize in playing fast, rhythmic acoustic guitars. The duo's members are Rodrigo Sanchez, lead guitar, and Gabriela Quintero, rhythm guitar. The musicians gained a reputation by playing in the pubs and bars of Dublin, Republic of Ireland, and despite their unusual style, gained a cult following. Reviewing one of their gigs, The Independent notes that "Rodrigo y Gabriela's secret is maybe quite simple. They are resourceful musicians who can really play, and are open-hearted, happy entertainers. That, very often, is what people want." Both live a vegan lifestyle and support animal rights.